...and it's the end of another artist, this time from the world of R&B. 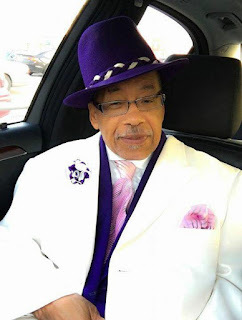 Marshall Thompson of the Chi-Lites has announced that the he will be retiring after a final tour next year to go into management. Good morning friends and family’ I like to take this time out to say it’s been a great Run” For me in the music business, I Have been truly Bless” for 59years, With The Chi-lites’ The Godfather Of Vocal Groups Marshall Thompson” of The Original Chi-lites” Will be retiring at 60years the end of 2019” The Chi-lites, Feat Marshall Thompson “ Farewell Tour will start January 1 2019” At the end of 2019” I will go in to Management to help Up Coming Entertainers’ That needs my help in the music Business, I Am The last Man Standing of The Original Chi-lites” I will never forget all our fans and friends.All over the world. The Chi-Lites formed in the late 50's when two Chicago vocal groups, the Chanteurs (Eugene Record, Robert "Squirrel" Lester, and Clarence Johnson) and the Desideros (Marshall Thompson and Creadel "Red" Jones) merged. Their first single, "You Did That to Me" (credited to the Hi-Lites) came out in 1964 but it wasn't until 1969 that they had their first hit with "Give It Away" (1969 / #88 Pop / #10 R&B). Five more top twenty R&B hits followed before they released "Have You Seen Her" (1971 / #3 Pop / #1 R&B) and "Oh Girl" (1972 / #1 Pop / #1 R&B), the records that brought them to the mainstream. In an amazingly long career, the group continued to chart on the R&B Singles charts until 1998. The Chi-Lites are members of the Vocal Group Hall of Fame (2005) and the Rhythm & Blues Hall of Fame (2013).